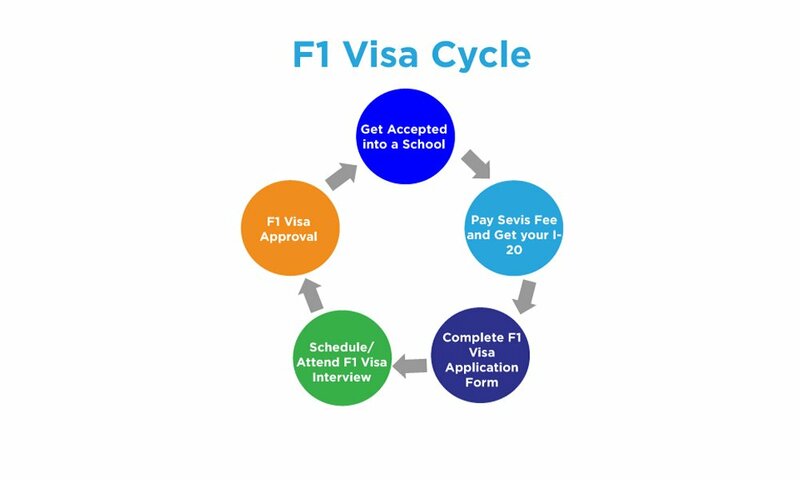 OM VISA Consultancy - Global Immigration, Students, Visitor, Business & Work VISA Consultants: US F1 Visa process by OM International...!!! US F1 Visa process by OM International...!!! At OM INTERNATIONAL, We believe in customized and extensive services to our clients. Experienced professional visa and Immigration expert provides excellent counselling for Admission Opportunities, Visa Guidance, Immigration and Documentation Services. We have a highly trained, dedicated and hardworking team to give the best solution to Students and Immigration aspirants. We have separate Departments such as IELTS / PTE/ Spoken English & Personality Development Training, Counselling, Filing, and Operations & Quality Control to provide the Excellent Service to all our clients. As a foreign student coming to the US, there is a US student Visa that you could be granted which popular known as F1 Visa. This F1 visa also allows you with the possibility of doing the job in the US during your stay. You need to get familiar with this type of visa; how it impacts your financing while you live in the US and how to go through the application and arrival process. An F1 visa is granted to foreign students who intend to attend the education program or English language program at a US college or university. F1 Students should maintain the least course load for status as a full-time student. They could live in the US up to the period of two months beyond the duration of time it takes to conclude the educational program unless they have applied and been approved to live and work for a period of time under the OPT Program. F1 students are expected to conclude their Education in the US by the expiry date on their I-20 form which is provided by the US University or college that the student has been accepted to and would attend. Overseas Residence – F1 applicants should have an overseas residence and should intend to return there after completing their education. Sponsoring institution – While on your F1 visa, you might only pursue Education in US college through which the visa is issued. Financial Assistance – Applicants should show that they have got enough funds to support their Education in US. Ties to Home Nation- All applicants should show that they have got strong ties with their home nation. Different universities have got different admission policies. Your university would tell you what they require to decide if you are educationally eligible. Among other criteria, you would require showing the college that you have got enough funds to assist yourself while studying without having to work and you might also have to show health insurance to cover any medical expenses. Once the university has decided that your application is complete and you are eligible, they would issue you an I-20 form so that you can go ahead to apply for your Student Visa. Before you could apply for your Student Visa, you should apply to and get accepted by a college approved by Student and Exchange Visitor Program (SEVP). Once you are accepted, you would need to pay the SEVIS I-90 in order to get enrolled in the SEVIS. Then, your college would provide you with a Form I-20. This form should be submitted to consulate officer at the time of visa interview. Applying for Student Visa might vary depending on the embassy or consulate you are dealing with. You would need to pay a non-refundable visa application fee. Also, complete and take a printout of DS-160 form to take to your visa interview. Applicants for the Student Visas should usually apply at the US Consulate and Embassy. This would normally be in your home nation, the nation in which you live. Although visa applicants might apply to the US consular office overseas, it might get more difficult to qualify for the visa outside the nation of permanent residence. Although the process might vary or need extra steps, depending on your nation and consulate or embassy, you would require the following when applying for your Student Visa. Application fee – You would have to pay a non-refundable application fee. It means that if your visa does not approve, you would not get your money back. Form DS-157 – A DS-157 form for all males who age is between 16-45. Valid Passport – A passport valid for travel to the States and with the validity date of minimum six months beyond your intended duration of living in the United States. If over one person is added to the passport, every person who desires a visa should make an application. Photographs – You could upload a photo that should be in color, it should be taken within previous six months to reflect your present appearance. The photo should be taken in front of a plain white or other light background. The photo should be taken in with full face view with the face directly facing the camera. The photo should have a neutral facial expression with both eyes should be open. The photo should be taken in normal clothes. Visa interview would be needed to decide whether or not you are qualified to get a Student Visa. You must arrive at the interview place with all the documents and receipts that are required, and you must be well prepared to respond personal queries about your decision to Study in US. Visa interview queries often include inquiries related to your education qualification and choice of university. You might need to prove that you have ties and responsibilities that would guarantee your return to your home nation after your Foreign Education. Most significantly, you would need to prove that you have got enough funds to finance your education. Education expenses in the country are quite high and presenting a strong financial plan for your duration of education is important to pass your visa interview. If approved, you might need to pay a visa issuance fee. Electronic fingerprint scans would be taken for to maintain the record. Your passport would be taken to issue the visa, and you would be informed when you could get it back, either through pickup or through the mail. You just need to keep in mind that the issuance of a visa is not guaranteed. Do not make any ultimate traveling plans unless your visa gets approved. If in case your visa is denied, you would be provided with a valid reason on what basis your application was denied. After your visa is approved, you are able to enter the country as a foreign student. However, after your arrival, you would require being aware of your obligations as a visa holder. If you do not maintain your valid visa status, you would not be permitted to return or re-enter the country and if you leave the country you would not get entitled for practical OPT or CPT program. Make sure you arrive in the country not more than one month before your first day in college. Check in with your Foreign Adviser as soon as possible prior your program starts. You should stay enrolled full time. You are required to attend the classes and maintain passing grades. If you got any difficulty in the class, inform your Foreign Adviser. If you are not able to conclude your education program by the date which is listed in your Form I-20, your foreign adviser could assist you in requesting an extension in your education program. Your passport must be valid for minimum six months. Your nation’s embassy or consulate could assist you in extending your passport if required. Students are not permitted to work off-campus. You might have got some on-campus or options of curricular practical training if you get qualified. Check with your foreign adviser to see if there is a possibility for you. You have got two months after completion of your education program to leave the United States under your visa. To stay in the country, you would require re-enrolling in any education program, transferring to another college to get a fresh I-20 form, or applying to change the status of your visa. Your foreign adviser could give you more details, regarding your options. If you are looking to Study in US, it is recommended that you go with a company that has got years of experience in the US Education process. 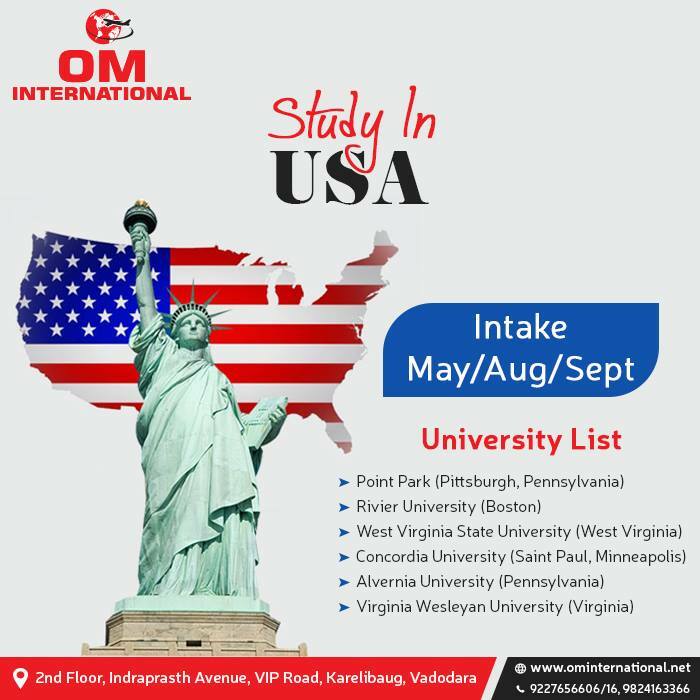 OM International is one of the Best Overseas Education Consultants in Gujarat that helps you in your US Education process. Om International have 100% Success Ratio till now with Expertise of 17 years.